My grandma used to grow rhubarb in her garden, crimson stalks topped with showy, fan like green leaves, and they’d make their way into an endless parade of rhubarb desserts, most noticeably strawberry rhubarb pie. Bright glowing pink, soft and beautiful pieces oozing fuschia juice. Rhubarb seems to be less fashionable in modern times, sometimes when I post a photo of it or check out at the grocer, people ask, “red celery?”, which is unfortunate as it’s really so delicious and a bright spot of spring, jewel toned and puckeringly sour with rich floral notes. Most often rhubarb is cooked, with sugar to soften its edges, although as a kid I’d often cut off the end, dip it in sugar, bite, and repeat. Perhaps it’s better to save that method for seasoned rhubarb lovers…it reminds me of the lovely man who brings quince to the market off an old tree of his grandfather’s. He told me his grandfather used to eat them raw as a child, which seems unpleasant to me, but things done in childhood are often hard to understand as adults, I suppose. Children don’t expect perfection nor do they have specific expectations which they need things to fit neatly into. 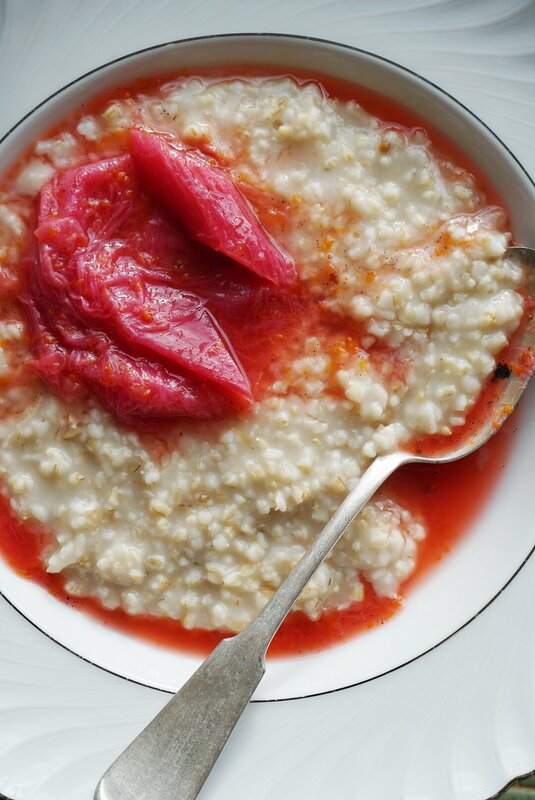 I digress, though- here are 2 simple ways we’ve been enjoying the first rhubarb of the season. Keep in mind sugar amounts will need to be scaled up or down depending on how sweet you enjoy your sweets. I hope you’re having a lovely April thus far. Slice the rhubarb and trim off any tough ends or residual green leaves (the leaves are toxic). Slice it into approximately 1 inch / 2.5 cm pieces. I like to slice on the bias (diagonal cuts) because I think it looks prettier, but any cut is fine, of course. Add the rhubarb to a pot with the remaining ingredients (slit and scrape the vanilla bean first, if using). Add a splash or two of water, about 2-3 tbsp (15-45 ml) and cook over medium heat until rhubarb has softened but still retains its shape, and the color seeps into the juice, 6-8 minutes. Remove from heat and eat or let cool before transferring to a jar to keep in the fridge about 1 week. Use to top morning oats, yogurt, eat with vanilla ice cream, heap over toast. Preheat the oven to 425F / 220C. 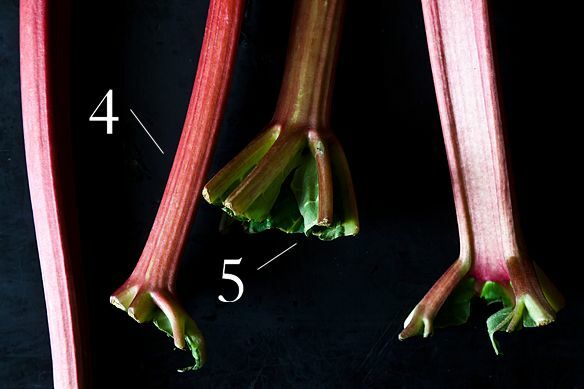 Slice the rhubarb into 1 inch / 2.5 cm pieces, cut on the bias, and mix with all other ingredients except dough in a bowl. Set aside to macerate while the oven preheats. Roll out your dough in a roughly circular shape (I roll it directly on parchment paper). Arrange filling in the middle of dough, spreading out evenly while leaving about a 2 inch / 5 cm border. Fold edges over filling, leaving an open circle in the middle (refer to photo). Slide galette onto a plate or baking sheet and transfer to the freezer for 15 minutes. This will ensure the fat in the crust stays cold and makes for a flakier crust. Remove from freezer, scatter over a bit more sugar (raw/turbinado sugar is great for this part), and transfer to a baking sheet. Bake for 25-35 minutes, or until crust is burnished and filling is bubbly. Cool on the parchment, on a wire rack. Wait 15 minutes before cutting and serving. This is delicious on its own, or you can gild the lily with a scoop of vanilla bean ice cream. here with the buckwheat crust from the e cookbook, page 359.